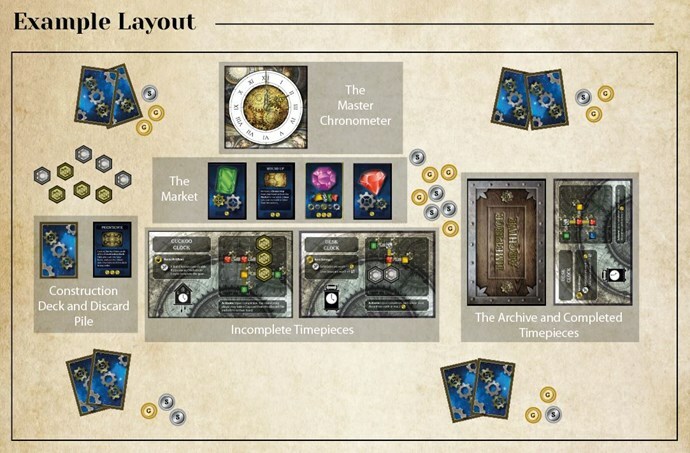 Just when we were running around thinking how are we going to have time to visit every stall, even with three days at the show, we spot Golden Ratio Games and their upcoming Kickstarter entry, ‘Making Time’. Steve McCormick, the Lead Designer, took some time to talk to us more about it. Just opposite the Golden Ratio Games booth are themeborne with their Kickstarter entry, Escape the Dark Castle. I spoke with Alice who is part of the company run by Thomas Pike. On the other hand, Warm Acre have been coming to the show since it began. 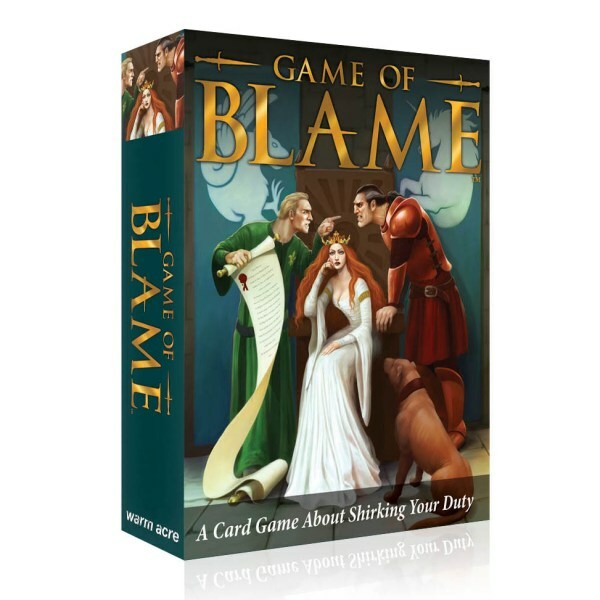 They launched the Kickstarter for their game ‘Blame’ at the show last year, which is now selling nicely in stores and online. Their latest release, Matchmaker 2, has also recently been successfully Kickstarted and is currently at the printers. “We’ve been doing this for 15 years,” Gavin says. “It’s just phenomenal to see how much the UK Games Expo has grown over the years”. With the hall coming to a close in the evening, we decided to head over and check out some Live Events. Pandemic Live was certainly the most popular. Completely sold out and with people queuing for over 2 hours to make sure they got a good seat, we were hopeful of a good show. 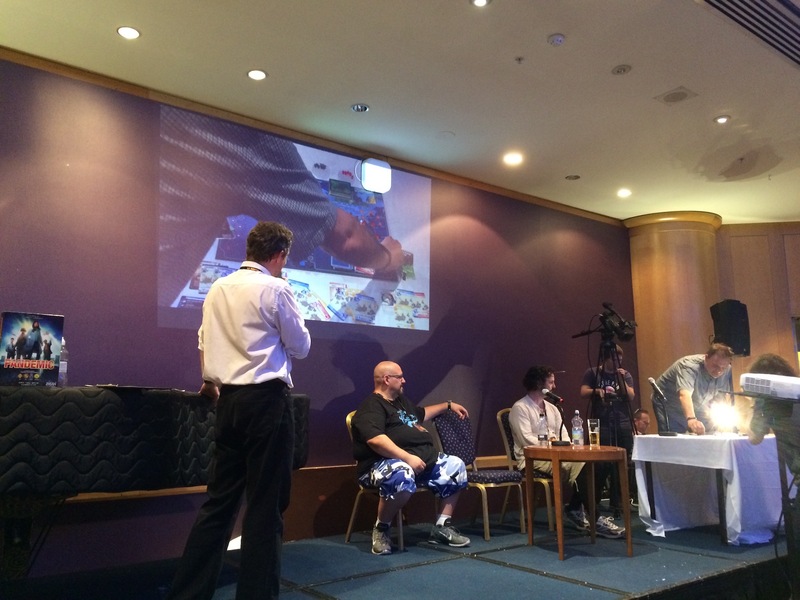 James Cook took to the stage to lead us through a live on stage game on Pandemic with Sam Healey, Paul Flannery and John Kovalic taking on the game with members of the audience participating as the fourth player. The game difficulty was set by way of applause from the audience and, with little regard to getting the two full hours worth of their tickets (£4), they selected Hard mode. Next the audience was asked to choose names for each of the diseases and thus we were tackling the Tories (blue), Katie Hopkins (yellow), Happiness (black) and Darren (red). The first turn of the panelists all went to plan before Moira stepped up from the audience. She made some good moves, but then proceeded to draw out an Epidemic card. Cue some music and a half-naked man in a bear mask dancing around to room to represent the epidemic. He wouldn’t be away for long, just long enough to change masks, as during the second round there was an early epidemic card which in turn triggered an outbreak. At this point, a member of the audience was stolen away by the diseased prancing pony. Our second audience member, Craig, made it through his turn without any drama. However, up stepped Sam who triggered the third epidemic at the start of round three. This time there was a triple outbreak, and more members of the audience were taken. John steps back up, not really sure how to handle the board that’s obviously getting out of control. He makes his move, but the infected city once again outbreaks. At this point, “disease bear” (for lack of a better name), takes a seat in the audience, realising he is near victory. 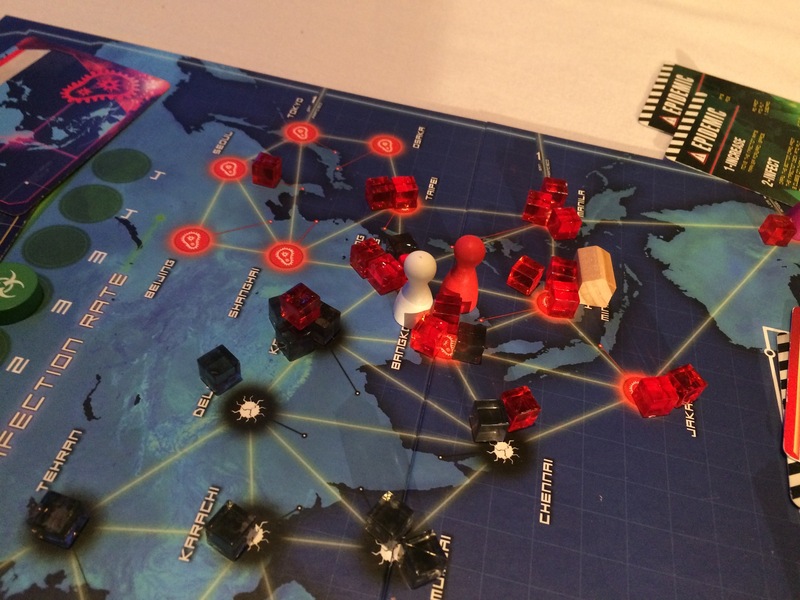 The next city card that John draws also outbreaks, and the chain reaction causes the final outbreak and the game is lost. Despite the event being over in half the time, the audience loved every minute of it. The result puts the show at a 1-5 win-loss record when running the event. 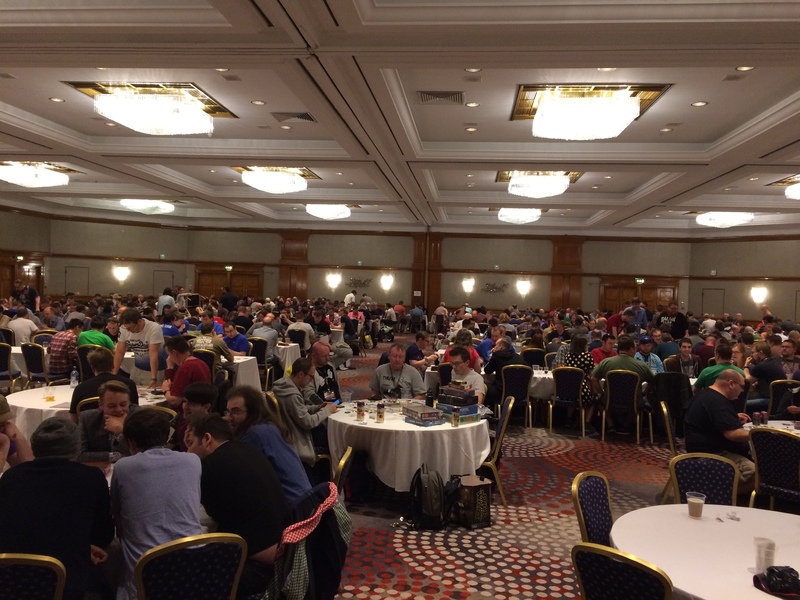 With the hall now closed we retreated to the open gaming rooms of the Hilton Hotel. We bumped into some of the staff from the Devir games booth who have come here to help demo their games. After some chat about how they were going to be trying very hard to leave with their pay intact and not blow it all on games from their own stand, we sat down for a game of Citadels. The game rooms were again packed to bursting, and games were still being played in the small hours of the morning as we retired for the evening.